What lies ahead for our world and for your family and loved ones? Available in Print or Online at our new BibleAnswers.Study website . Discover life's answers in our free study course covering the main themes of the Bible in 12 easy lessons. Of course, it's absolutely free, with no hidden cost or obligation. 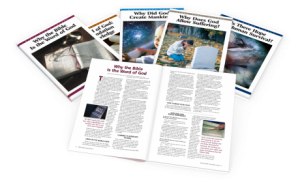 You may also choose the option to have the Bible study lessons mailed to you, completely free of charge. Before you start, you may wish to first test your Bible knowledge with our Lesson QUIZES. In this lesson you will discover how the Bible can transform your life in ways you've never imagined. God's Word reveals the values to solve the dilemmas that threaten to overwhelm us. In this Bible Study Lesson, you will find answers to why you were born and what your future will be. There is a reason you exist. Do you know? 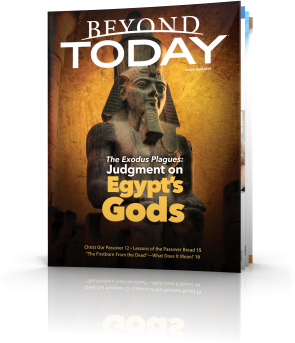 Learn how to reconcile anguish and suffering with the Bible's portrayal of a loving God. Is There Hope For Human Survival? Many threats to human survival play prominent roles in prophecies in the Bible. Is the work of organised religion the Kingdom of God on earth today? This is the central idea that shapes the view of the religious world. But is this the same Kingdom of God the Bible describes? What is the meaning of God’s relationship with humans? In this lesson we examine the process by which our lives can be turned to God—the process of conversion. In this lesson we examine this remarkable change, made possible by the transforming power of God’s Spirit. What does the Bible mean when it talks about the Church? Are we free to worship God as we wish, to refashion God in our own image? In this lesson we examine how we are to approach God in the way we live our lives. Humanity has been deprived of a comprehensive understanding of God's plan and purpose for humankind that are revealed in the prophecies and teachings of the Scriptures related to His sacred festivals. In this lesson you will learn about the keys that unlock these wonderful truths. The Bible is filled with timeless wisdom to help you in your career, marriage, family relationships, finances, friendships, and every other major aspect of life. But for many people, understanding the Bible can be difficult. "To what greater inspiration and counsel can we turn than to the imperishable truth to be found in this treasure house, the Bible?" Life can be hard enough, the Manual doesn't have to be! How will the world finally find peace? What will happen before that finally comes to pass? The Bible reveals many details about end-time events and the major trends that will lead up to Jesus Christ's return. Read this featured booklet to learn the answers. Did Jesus do what the records show? Was He, is He, really who He claimed to be? Can it be proved historically? Or are we left to simply accept it on blind faith? This booklet seeks to address and answer the major questions that intelligent, reasoning people naturally ask in trying to understand Jesus Christ--the real story. This guide first lists a summary of each belief from the Constitution of the United Church of God, an International Association, then explains and expands on each of those beliefs. Additional booklets on these topics are available free of charge. The Bible is the world's best selling book...yet, in spite of the Bible's popularity, it has also been described as the world's most misunderstood book. Have you been one of those who have found the Bible difficult to comprehend? Do you wish you knew how to better apply its timeless principles, how to use it to build a right relationship with its author, your Creator? This eye-opening booklet will examine seven keys that will help open up this Book of books to your understanding. has the 2nd coming of Christ already occurred? Matthew 24:30 "Then the sign of the Son of Man will appear in heaven, and then all the tribes of the earth will mourn, and they will see the Son of Man coming on the clouds of heaven with power and great glory. I Thessalonians 4:16 For the Lord Himself will descend from heaven with a shout, with the voice of an archangel, and with the trumpet of God. Zechariah 14:4 4 And in that day His feet will stand on the Mount of Olives, Which faces Jerusalem on the east. And the Mount of Olives shall be split in two, From east to west, Making a very large valley; Half of the mountain shall move toward the north And half of it toward the south. The second coming of Jesus clearly has not occurred yet. When it does, the whole world will know about it. YOU’RE ABOUT TO DOWNLOAD OUR FREE STUDY GUIDE! Opt in to our newsletter list to receive other special free offers. Click on the link below to download your free guide. Holidays or Holy Days? Does it Matter? 3: Why Did God Create Mankind? 4: Why Does God Allow Suffering? 5: Is There Hope for Human Survival? 6: What Is the Gospel of the Kingdom of God? 8: What is Christian Conversion? 10: What is the Church?